Now you can also try ConVirt from Amazon EC2 and manage your enterprise environment. 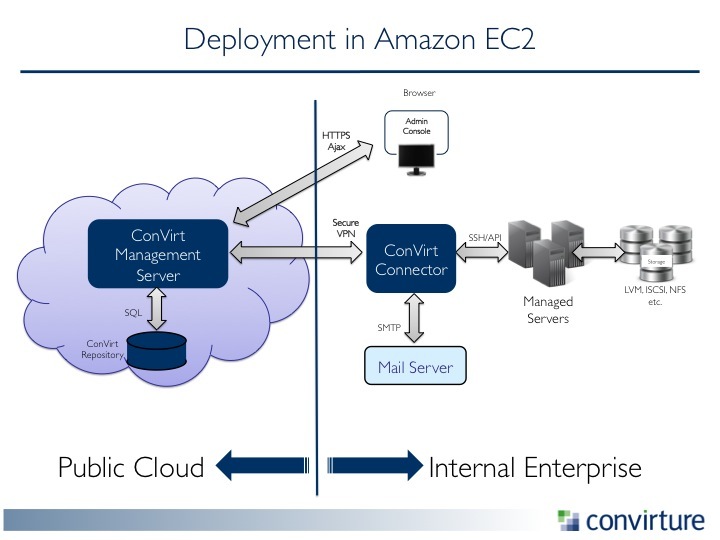 Here is a diagram of ConVirt deployment in Amazon EC2. Basically ConVirt in EC2 accesses all infrastructure via ConVirt-Connector. The Connector establishes secure vpn connectivity to the enterprise. NOTE : You will be charged by amazon depending on the use of virtual machine. Starting the ConVirt-Appliance in Amazon EC2. Click EC2 from AWS Console or Select EC2 from Services drop-down if you are in other console. Select N. California (US-West) region by selecting drop down from top right. Select Public AMI from drop down and search for "ConVirt-OSS" on Amazon EC2 in N.California (US-West) region. Pick the latest release and build. If required,copy the AMI to region of your choice. Launch the AMI image, with following choices in the wizard. Select appropriate details on 'Configure Instance Details' page. Defaults are ok.
On the 'Tag Instance' page, put appropriate value for the Name tag. Change the name and description of newly created security group shown on the page and make sure it had the following two rules. When you press 'Review and Launch' button, you will be prompted for generating or using an existing key. You will need this to access the ConVirt-Appliance so don't forget to download and save it. (e.g., ~/ec2_creds/keys/my-convirt-appliance-key.pem). We will refer to it as ConVirt-Appliance Key. Go to Instances pane, and wait for the instance to initialized completely. Now go to Elastic IPs option under Network and Security from the left navigator. Allocate a new Elastic IP Address or select from existing list. Use the Associate button, and select the ConVirt-Appliance instance you just started. Note down the Elastic IP, we will refer to it as ConVirt-Appliance IP. It will prompt you to accept the fingerprints. Say yes. Expected result: The response should validate that openvpn is running. If you see the expected results in all cases, your appliance is set and ready to go to the next step. Use a browser and point it to https://<ConVirt-Appliance IP>:8082/login . This should bring up the ConVirt application in the browser. You will be promoted for security warning, as the default ssl cerificate is self-signed. Follow your browser specific prompts to continue with the warning. Login using 'admin' user and 'admin' password. Use the 'Change Password' option from the top right to change the default password. NOTE : Treat this step as mandatory for security reasons. For ConVirt to manage your virtualization infrastructure from ConVirt-Appliance in EC2, you need to have connectivity between the two. If you already have a VPC connected (using Virtual Private Gateway at EC2 and Hardware VPN at your premise) to your enterprise infrastructure and administrators, you can skip this section. For those who does not have this setup, Convirture provides a Connector to establish secure connectivity to the ConVirt-Appliance. Download the appliance here and follow instructions for your virtualization platform. Use this section to start the Connector Appliance on your management network. Refer to next section for troubleshooting in case you run in to issue. tar -xzf connector-ref-disk.tar.gz  # point to full path of downloaded reference image. KVM Binary name : On few of the platforms you might need to give full path of the binary. Here are couple of common places. Replace this with 'kvm' in the commands above. If you see, the following message, change 0.0.0.0:25 to some other port, to avoild conflict with existing vnc ports in use. If you see, the following message, empty out content of etc/xen/scripts/vif-bridge and try again. device tap0 is already a member of a bridge; can't enslave it to bridge br0. Connect using vncviewer. In the above command port :25 is used. Use this method, if you have an existing ConVirt deployment and are trying out ConVirt in Amazon EC2. You can use the following method to install/start Connector appliance. Select the newly created template and select Edit from the right context menu. Select Linux, Ubuntu and 12.04 as Guest OS Flavor, Guest OS Name and Guest OS Version. Select the cdrom entry and select remove. Select the hda disk entry and choose Edit. In the reference location, select the absolute path of the downloaded connector appliance. Note this path should be valid path on the managed server. Press ok to save the template. Select the template and provision the virtual machine as usual. Get to your virtual machine Console and find out the Connector IP Address. Login to the Connector, using connector as username and convirt as password. Check the connectivity as follows. ConVirt-Appliance-Key: Path to ConVirt-Appliance key to access ConVirt-Appliance. NOTE : No user name before the ConVirt-Appliance IP. Now that Connector is configures successfully, we need to ensure that we can communicate between ConVirt-Appliance and rest of the infrastructure. Add a static route to the router to allow connectivity/return path to the ConVirt appliance network. The steps to do this will be route specific, we need to establish the Connector (local ip/ip on management network) as gateway to the ConVirt-Appliance network. Now, if the you do not have permission to change router settings, and the network administrators are not reachable, you can use the second option to achieve the same. In this option, we set up the connectivity for each managed server individually. This is covered in Preparing Managed servers here. You will get to it as a part of upcoming installation steps. To continue follow link here.